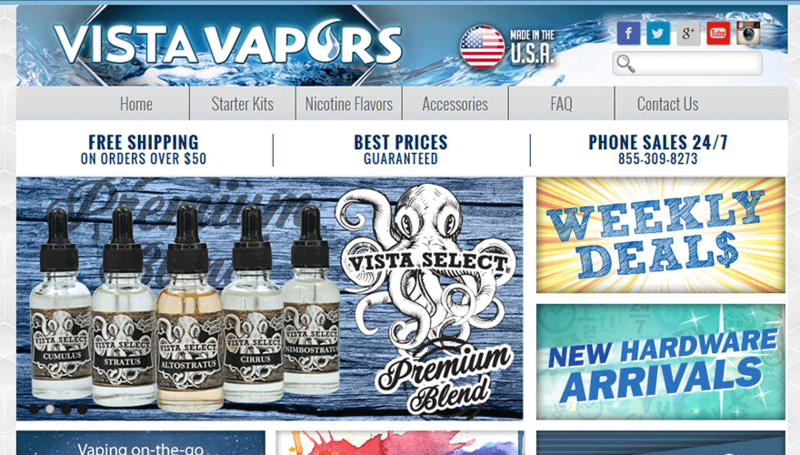 Vista Vapors is a newer e-cigarette company that offers made-in-the-USA products. They currently offer over 160+ flavors to choose from that all start at $4.99 each for 17ml of liquid. By far, Vista offers the biggest choice of flavors on the market and top that off with the ability to mix the flavors to make your own custom flavor means they have millions of possible flavors available to you. They offer 160+ flavors making them one of the more popular e-liquid providers that people order from. They offer several kits to choose from with various styles available. They only offer a 14-day return policy on their hardware and accessories only if the products are unopened. If you open your order, no warranty is offered. For the beginner, Vista Vapors offers 3 kits to choose from but the one that stands out for us is the one pictured to the left, the Vista Top 5. This kit offers a Single E-Cig kit and 5 popular flavors: Arctic Chocolate, Green Apple, American Tobacco, Lime Soda and Crazy Berry. This kit includes no e-liquid but includes the hardware you’ll need to vape. You’ll get a VistaVapor 900mah battery, Viva nova top (holds the e-liquid) and a USB charger. Price: $18.99 + you’ll need to add your choice of flavors at an additional cost to your cart. Order the Double E-Cig Kit for $35.99 if you want 2 e-cigs. 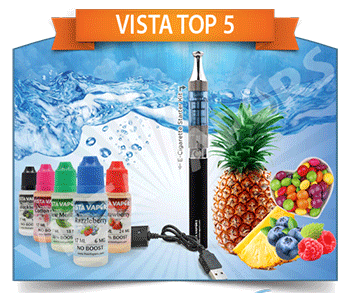 Vista Vapors offers several vaping solutions provided by a few popular brands including Innokin, KangerTech and more. Depending on your needs, these options are sure to solve your needs as an advanced vape user. Current pricing ranges from $29.99 to $149.99. Each e-cig kit offers features that you should review before purchasing. Vista Vapors offers 6 nicotine levels with their flavors which include Nicotine free, 3mg (very low), 6mg (low), 12mg (medium), 18mg (high) and 24mg (very high). Lastly, Vista offers 4 bottle sizes: 17ml ($4.99), 32ml ($7.49), 52ml ($10.99) and 102ml ($16.99). Additionally, they offer some “Vista Select” premium e-juice choices that are more expensive than their standard flavors. As for the actual flavors, be sure to visit their website. You’ll find flavors in 8 categories that include: Candy, Dessert, Drinks, Fruit, Menthol/Mint, Specials, Tobacco and Vista Select. Vista Vapors only offers a 14-day return policy on unopened hardware. This is due to the fact that most of the hardware listed on their website are from other companies besides the kits listed under Beginner Kits which belong to Vista Vapors. Currently, they offer a FAQ section that answers less than 20 questions which we think should be expanded. To contact them, you’ll have a few choices available to you. Telephone sales support is available on a toll-free telephone number and is available 24/7. If you need support for your product, the same toll-free number is available but support is only available Mon-Fri 9AM-4PM CST. You’ll also find direct email addresses to email or you can use their provided contact form.